Home » » An Introduction to the community Tourism industry meeting was held at Sri Vimukthi Fisher Women Organization office today. An Introduction to the community Tourism industry meeting was held at Sri Vimukthi Fisher Women Organization office today. An Introduction to the community Tourism industry meeting was held at Sri Vimukthi Fisher Women Organization office today. 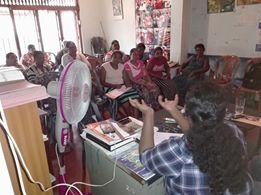 we talked about how to promote the community tourism in the negombo. at the same time we talked visit of Japan team arrival and its experience.